John C. Simms, VMD, MS, graduated from the University of Pennsylvania School of Veterinary Medicine and practiced at Farrell Veterinary Clinic in Tioga County. Dr. Simms purchased a practice from Dr. David Stringfellow. The practice had previously been run out of Dr. Stringfellow’s home on Middle Spring Road in Shippensburg. Dr. Stringfellow later worked for the Pennsylvania and United States Departments of Agriculture, then went into academia. For the first 3 weeks, Dr. Simms operated the practice out of the Wyncoops Motel. He then moved it to the basement of his rented Prince Street home. Dr. Simms purchased a 114-acre farm from Dana Ile and practiced out of the summer kitchen of the old brick farm house. The farm was on unpaved Burnt Mill Road. 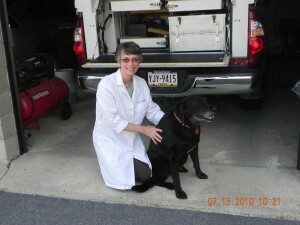 Nadine Oakley, VMD, graduated from the University of Pennsylvania School of Veterinary Medicine and married Dr. Simms. She received her first Ford truck as a graduation present, and she and Dr. Simms drove to Iowa to get her a Royal 8 vet pack for their honeymoon. Dr. Oakley became the first woman to practice large animal medicine in Shippensburg. The clinic was designed on a napkin at the Toll Gate Restaurant. Gawin Morrow constructed it in two phases. First, an old cinder block outbuilding was converted into the large animal hospital and surgery suite which is still unique to the immediate area. Pennsylvania State University graduate David Wolfgang, VMD, arrived and stayed until 1993. He was the Field Studies Director at the Pennsylvania State Extension Service until 2016. The small animal hospital was built on top of the large animal hospital. BMVC hosted a centennial birthday party for the Burnt Mill Bridge that crosses over Conodoguinet Creek. Dr. Phillip Lantzi joined the practice, staying until 1988. 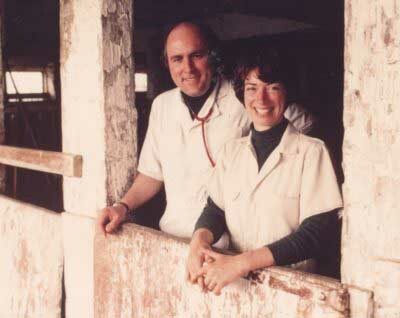 Pennsylvania State University graduate Alan Statter, VMD, arrived and stayed until 1991 when he built his own small animal hospital, Mount Airy Veterinary Associates, in Mount Airy, MD with his veterinarian wife Amy Stader, VMD, a 1992 Pennsylvania State University graduate. Dr. David Cole practiced at Burnt Mill for a year. Dr. Juliette Hanson arrived, staying until 2000. 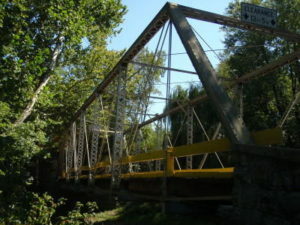 Dr. Samantha Edwards practiced at Burnt Mill for a year. Dr. Robyn Dohanish joined the practice, leaving in 2008. 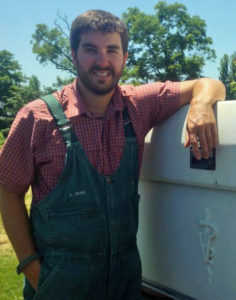 Ben Rhodes, DVM, a 2009 Washington State University graduate, joined the practice. Burnt Mill Veterinary Center went online at www.burntmillvet.com. Dr. Rhodes bought the practice from Drs. Simms and Oakley almost 38 years after they purchased it. Drs. Simms and Oakley retired. Both continue to be active PVMA members. Levi Smith, DVM, joined the practice, leaving in Aug 2016 to pursue a specialty in embryo transfer. Blueberry, the 1993 Ford Ranger, has served BMVC reliably, trucking from one farm to the next for a good long time. While Blueberry is Dr. Rhodes' favorite truck, he can't quite haul all the high tech (i.e. heavy) gear the vets like to take along. He still has his vet box, just waiting for one of those new, big, fancy trucks to show how unreliable they can be. Joanne Trez retired at the end of 2018 after more than 20 years as Burnt Mill's receptionist. 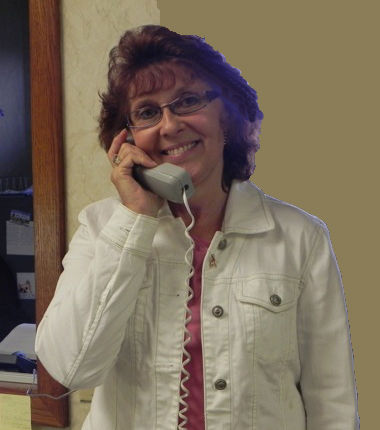 She has been busy riding her horse Max, playing with her 2 granddaughters, and volunteering in the community. Congratulations, Joanne!